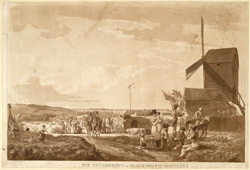 View of a military encampment at Blackheath, at this time part of Kent. The heath was cut through by the Roman road between London and Canterbury/Dover. It was sometimes used for military reviews and recreational purposes. The creator is Paul Sandby (1725-1809), who was one of the most important English watercolour artists of the late 18th century. This picture shows his amusing, slightly caricatured depictions of people. Also in the King George III Topographical Collection are several other of his views of encampments in London at Hyde Park, St James's Park, the British Museum garden.